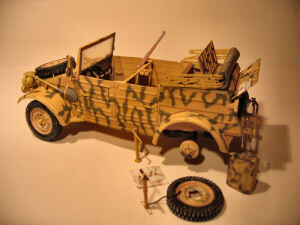 This site will show models I have made during a couple of years. 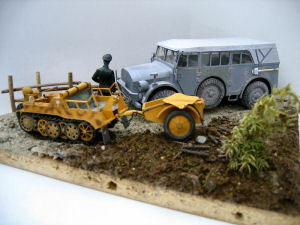 The SD KfZ-2 NSU Kettenkrad in 1:25 scale was a very fun build!The overall fit was very good. The lasertracks I got from DrafModel did the last finish of the model. This kit from Modelik can be highly recommended!! More models from Modelik will be presented on this site. Be sure to check my friends sites!! The Kübel had a broken tire,and it had to be fixed. First parts of Jim Nunns review of the Halinski Panther is ready in the reviews section. Construction report of the LeFh cannon is started! !